I've never considered myself one to chase restaurants run by the "celebrity-chef". After all, when the kids were younger, it was not really practical as well (in terms of appropriate food and cost). But if I look at some of my choices, there have been the several restaurants that I have targeted based on the chef. This is particularly true when Viv and I go on vacation without the kiddies, such as our visit to Juniper & Ivy in San Diego. Now that we were in New Orleans sans enfants, we put that into effect by dining at Emeril's. 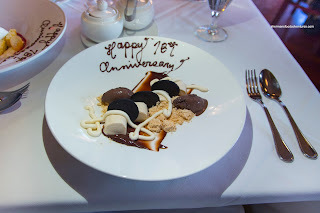 Next up was John Besh's flagship restaurant, August. 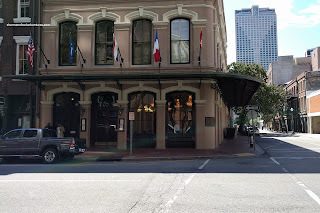 Viv and I decided to do a la carte rather than the tasting menu as we were already getting full after the second day in NOLA. 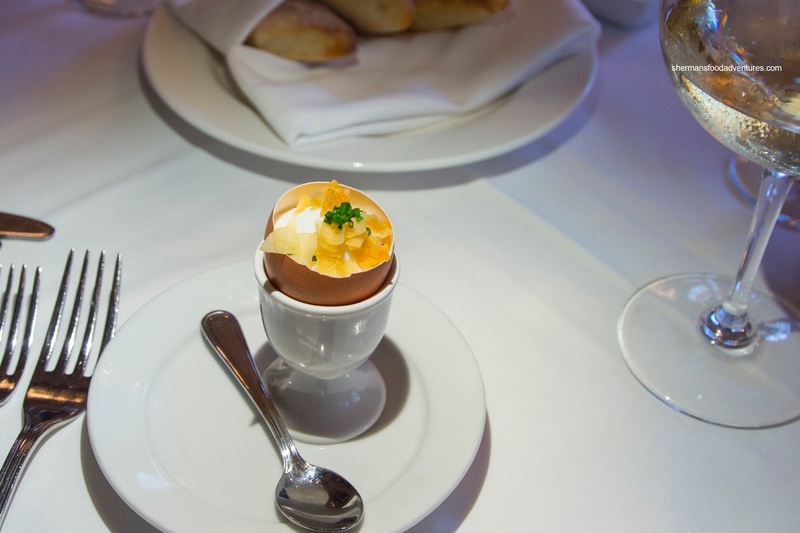 They started us off with an Amuse Bouche consisting of garlic, leek and potato soup topped with crispy potato served in a hallowed-out egg. This was a wonderful little start to the meal with aromatic flavours and different textures. Nothing was overpowering another where there was balance. Loved the presentation too. For our actual starters, Viv had the Potato Crisp P&J Oysters with malt, tarragon and pickle of Covey Rise vegetables. The oysters were plump with sweet briny juices. Crispy and light, the potato crisp coating was devoid of grease. There was a good amount of spice that was not overwhelming while the malt vinegar was impactful in the creamy aioli but was still balanced. 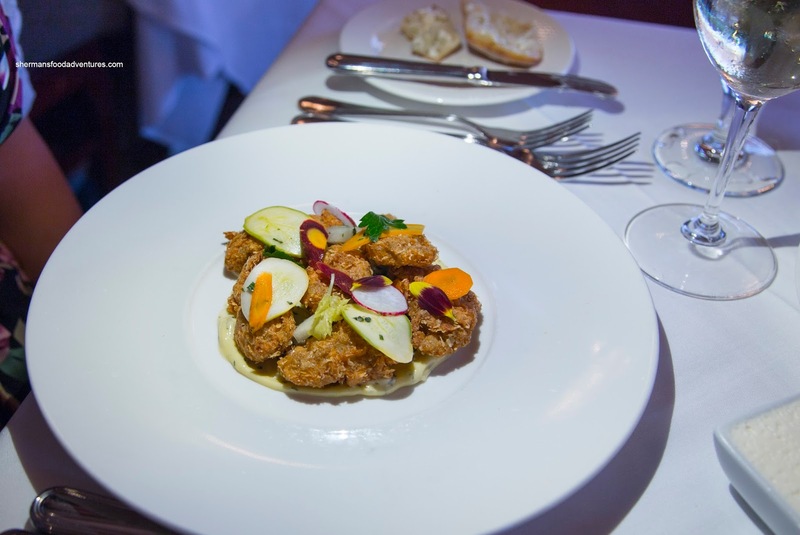 Providing both acidity and a textural contrast, the pickled veggies were appealingly crunchy. For myself, I had the Spicy Crab Cornmeal Tartlette with basil, burrata and heirloom tomatoes. 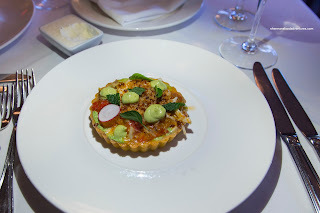 Chock full of fluffy sweet crab, the tart was on the wetter side. It was due to the tomatoes which were plump and tangy. However, the firm tart shell held everything together. Loved the combination of the creamy burrata and bright tomato as well as the smoky and salty bacon. On top, the crunchy cornmeal topping added a nice mouth feel. For my entree, I decided on the Roasted Triple Tail with black garlic, corn, chanterelle and blue crab. I found the triple tail to be seared expertly being crispy and well-seasoned while sporting a flaky and barely-cooked interior. 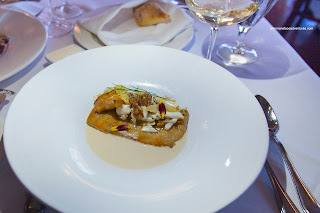 I really enjoyed the silky sweet crab and corn jus as it was flavorful in a natural manner. The Earthy black garlic added a robust taste to an otherwise light flavor profile. The aromas and developed flavors were kicked up even more by the chanterelles and chunks of fluffy briny crab. This was a fairly subtle dish, but it was supremely composed with layers of taste. Viv opted for the Five-Spiced Breast of Duckling with fig, summer peppers, foie gras and heirloom grits. 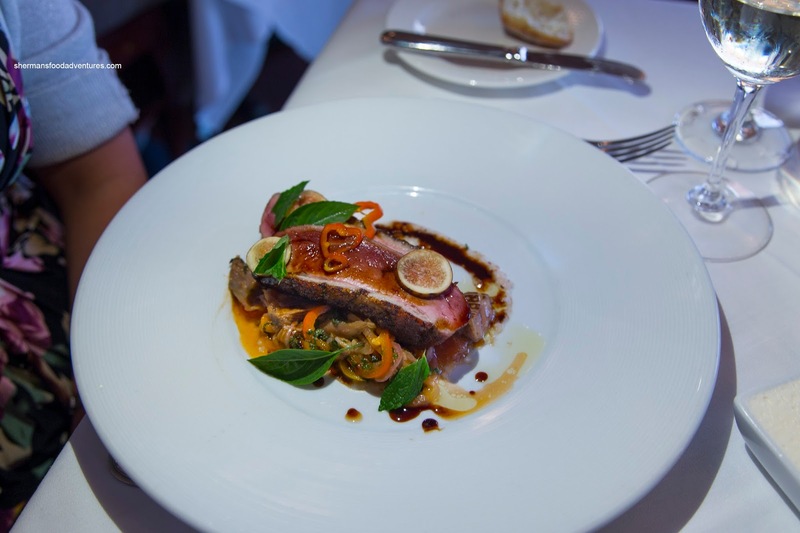 We found the duck prepared medium-rare being tender and succulent. It was nicely seasoned (especially the seared skin), but the skin could've been more rendered. The buttery foie was accented well by the sweet marmalade while the pickled peppers and onions added a tangy sweetness to the dish. 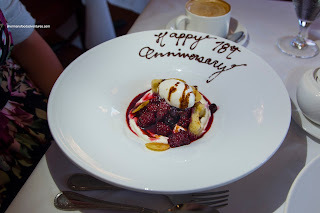 For dessert (and no, it wasn't our 78th anniversary... LOL), Viv went for the Fior di Latte with dark berries, ricotta, pound cake and aged balsamic. This was beautifully plated with surprisingly light and airy pound cake which was still buttery and just sweet enough. The ricotta was rich and creamy, yet a bit too strong on its own. When combined with the berries, it was more balanced. However, the berries were only mildly sweet. The ice cream made up for it though as it was creamy and sweet with the light hint of balsamic. For myself, I had the Peanut Butter Ice Cream Sandwich. This was killer with a creamy semifreddo that was aromatic and just sweet enough. The crispy cookies were a nice textural contrast and were not too sweet. Loved the dehydrated peanut butter dust as it added another layer of creamy peanutiness. The creamy chocolate ice cream was rich and did not add any unnecessary extra sweetness to the dessert. As for celebrity chef restaurants go, we though August lived up to our expectations. Yes, it was pricey, but with things considered, it wasn't overpriced.